This article gives instructions on how you can configure the Network Media Hub with a WGA600N. There are two ways to configure the WGA600N. You can use the Setup CD for easy setup or the WGA600N web-based setup page for advance configuration. NOTE: Determine first the wireless settings from your access point or your wireless router which include: SSID, Encryption and Passphrase or Security Key. Turn OFF your Network Media Hub before using the Setup CD of the WGA. Connect an Ethernet cable (also referred as an Internet cable) to your WGA600N and to your existing router or your computer. Insert the Setup CD and the Setup Wizard window will appear. Click Next until you reach the Connect window then click Skip. On the Available Wireless Networks window, select your SSID and enter your wireless security settings. If the SSID does not show up, click Advanced Setup. NOTE: You may skip the next steps right after you select your SSID. To setup your Network Settings, select Obtain network settings automatically (DHCP) or Specify network settings (Static IP) for advance configuration. Then, click Next. NOTE: Static IP address is recommended. The image below shows an example of the information needed to be entered upon selecting Specify network settings. To set up your Wireless Network Name, enter the SSID then click . 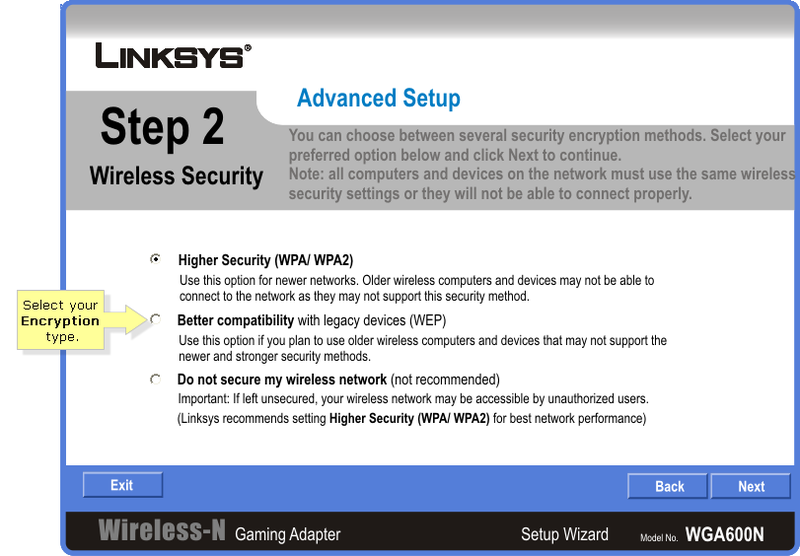 To set up your Wireless Security, select your Encryption type then click Next. Enter your wireless security key in the Passphrase field. Then, click Next. Once you’re done, click Finish. Disconnect the WGA600N from the router and connect it to the Network Media Hub using an Ethernet cable. Turn ON your Network Media Hub, wait until it boots up. Connect the WGA600N directly to your router and check its IP address in the router's DHCP Client Table. To learn how to access the DHCP Client Table, click here. Access your WGA600N web-based setup page. 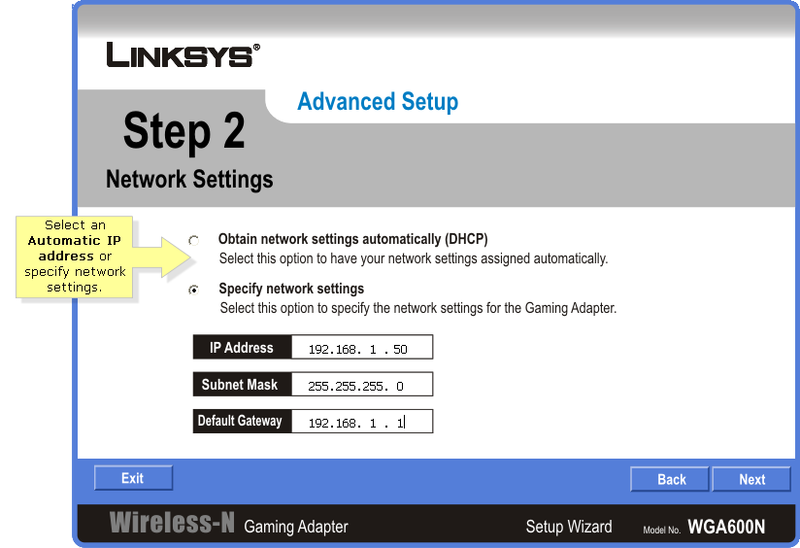 Click Basic > Wireless and select Wireless Bridge as the Wireless Network Mode. Enter your SSID in the Wireless Network Name field then select your encryption type under Security Mode. NOTE: In the image below, linksys is taken as an example of an SSID. Enter your wireless security key. 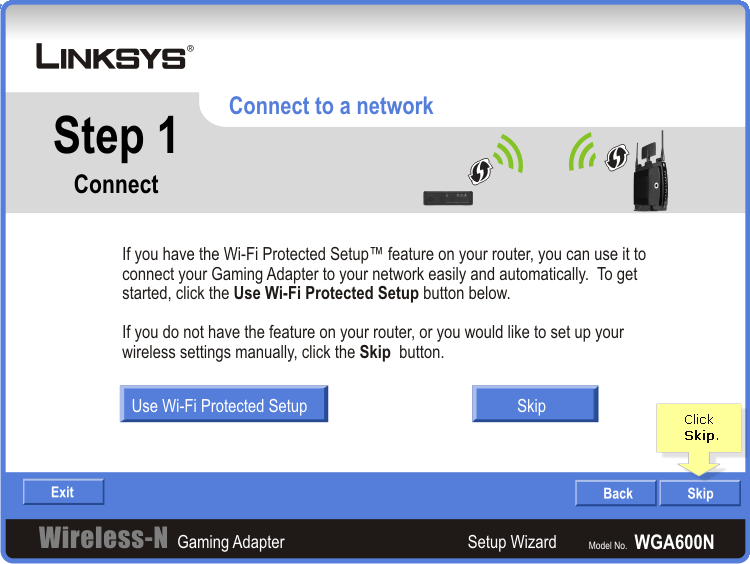 NOTE: Make sure that the key you will enter matches with your router’s wireless security key. The key is case-sensitive. • If you’re using WEP, enter your security key in the WEP Key field. • If you’re using WPA-Personal, enter your security key in the Pre-Shared Key field. Click at the top portion of the page. NOTE: For advance configuration, you can also assign a static IP address to the WGA600N by clicking the Network Settings sub-tab or you may just skip this step. Disconnect the power cord and Ethernet cable of the WGA600N from the router and connect it to your Media hub instead. Turn ON the WGA600N, wait about one minute after its Wireless LED has turned ON and ping the device to confirm connectivity. Turn ON the Media Hub. It should be wirelessly connected then. NOTE: The Media Hub will have its own IP address different from the WGA600N but they will be both in the same IP range. • Access the Media Hub utility by its Friendly name that you had previously configured. • If you have an NMH4xx, scroll thru the LCD screen to check the IP address under Status > Net. • Check the IP address of the Media Hub in the router's DHCP Clients Table if the Media Hub was set to DHCP.